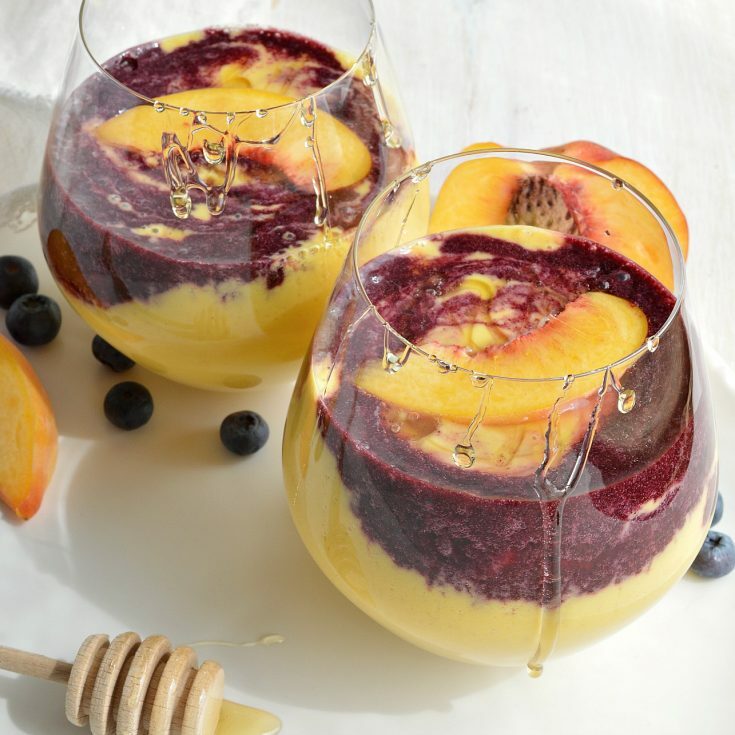 If you enjoy healthy smoothie recipes and unexpected flavor combinations these Peach Smoothies with Wild Blueberry Swirl are for you! 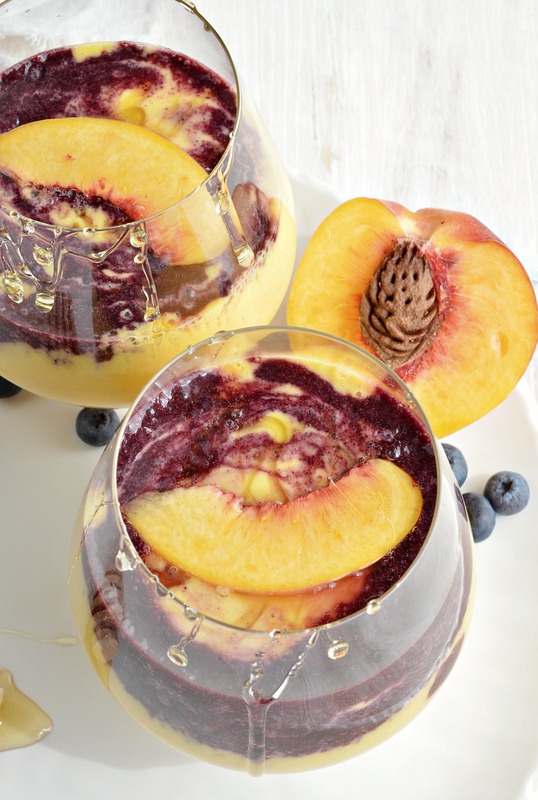 Fresh peaches and frozen wild blueberries make a delicious and beautiful meal. 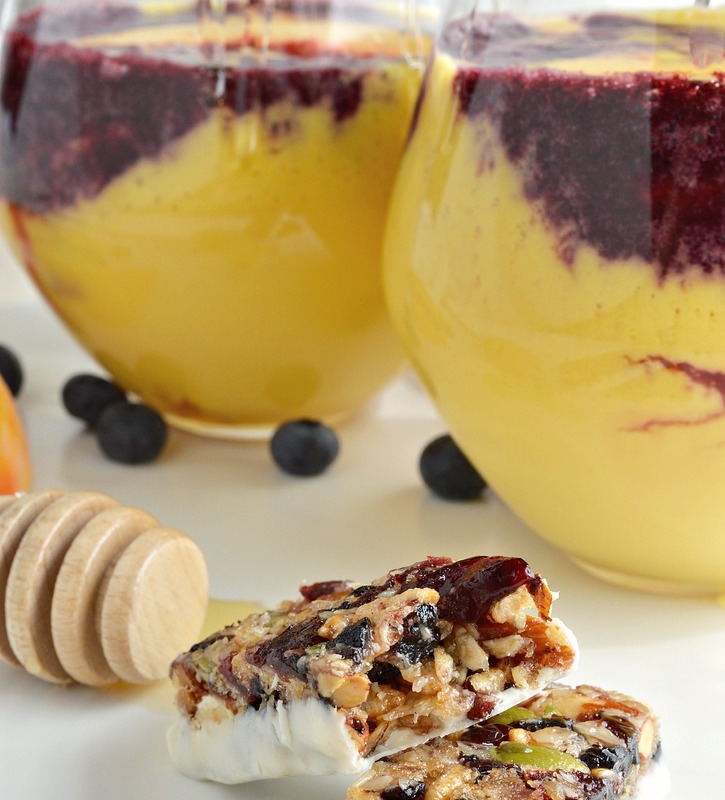 These smoothies are perfect with Hershey’s new BROOKSIDE Yogurt Flavored Fruit & Nut Bars! So Many Flavors! I live on fresh peaches during the summer months. I’m lucky enough to live in California where the peaches are fresh and juicy. Little known fact, I am originally from Georgia. So, between my California and Georgia roots . . . peaches are in my blood! These Peach Smoothies with Wild Blueberry Swirl bring my love of peaches and interesting flavor combos together. That is why I am excited about Hershey’s new Brookside Yogurt Flavored Fruit & Nut Bars. These snack bars combine intriguing ingredients and fruit flavors that make them simply delicious and sweetly satisfying. Plus, I find it hard to be satisfied with just a smoothie. I need something to chew on. 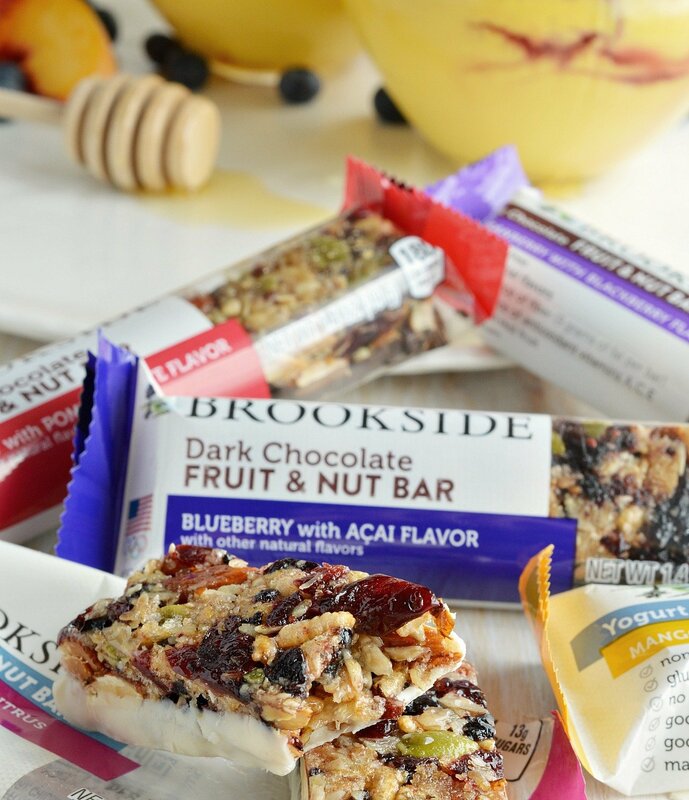 So a fresh smoothie and Brookside Yogurt Flavored Fruit & Nut Bars make the perfect snack! 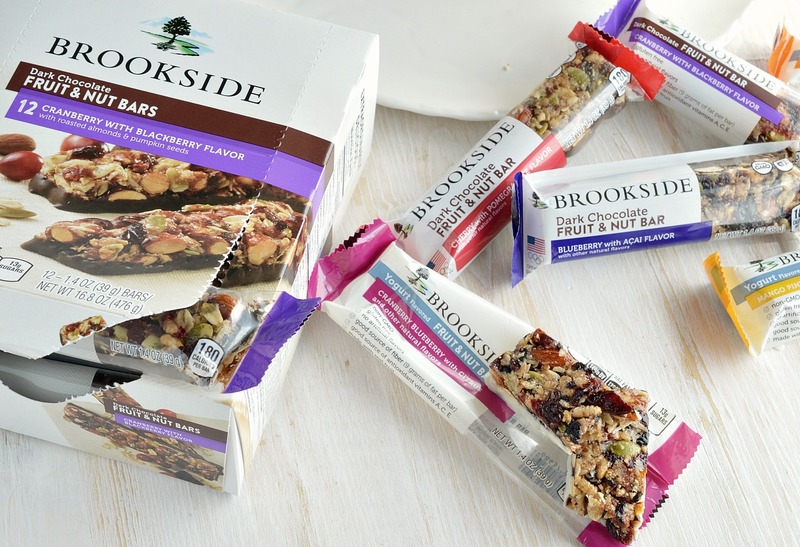 Brookside Yogurt Flavored Fruit & Nut Bars are gluten-free, non-GMO bars that contain no artificial flavors. 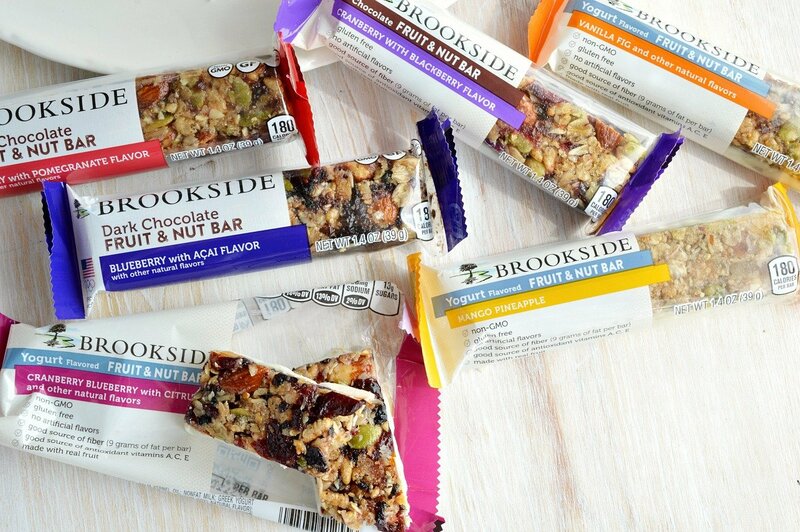 There are so many Brookside Fruit & Nut Bar flavors to choose from: Dark Chocolate Blueberry with Acai Flavor, Cherry with Pomegranate Flavor and Cranberry with Blackberry Flavor. Now the Yogurt Flavored varieties have three new flavors to experience: Cranberry Blueberry with Citrus, Vanilla Fig and Mango Pineapple. Brookside wants you to share something unexpected about yourself (especially if it’s something adventurous). Maybe you are a kindergarten teacher who loves to ride old motorcycles on the weekend or even a model who is also a rocket scientist. Join the conversation using #ShareYourBROOKSIDE to tell the world about your two sides. Visit the BROOKSIDE website for more information. If you #ShareYourBROOKSIDE, you could win up to $1,000 toward a unique and fun adventure! Share your unexpected side on Twitter or Instagram using #ShareYourBROOKSIDE and #SweepsEntry! You can also enter by commenting on a sweepstakes posts on the Brookside Facebook page. 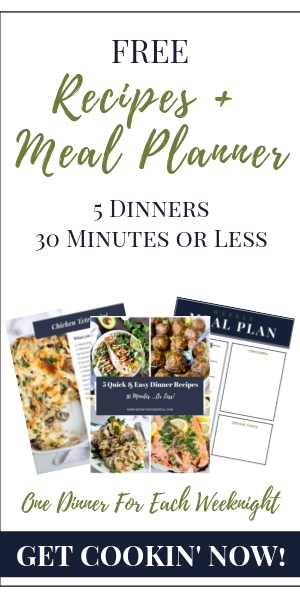 Visit https://shareyourbrookside.com/ for Full sweepstakes rules. But, I will eat just about anything. And I mean anything! I will taste and try anything no matter how disgusting or bizarre it seems. I may not like everything I try but I will at least sample it. I’ve eaten gator, shark, crickets, mealworms, snails, frog legs, crawdads, armadillo and any strange alien-looking fruit I can get my hands on. And that is just a few examples off the top of my head. I have a curious palate and a cast iron stomach! Process peach layer ingredients in blender until smooth. Process blueberry layer in blender until smooth. 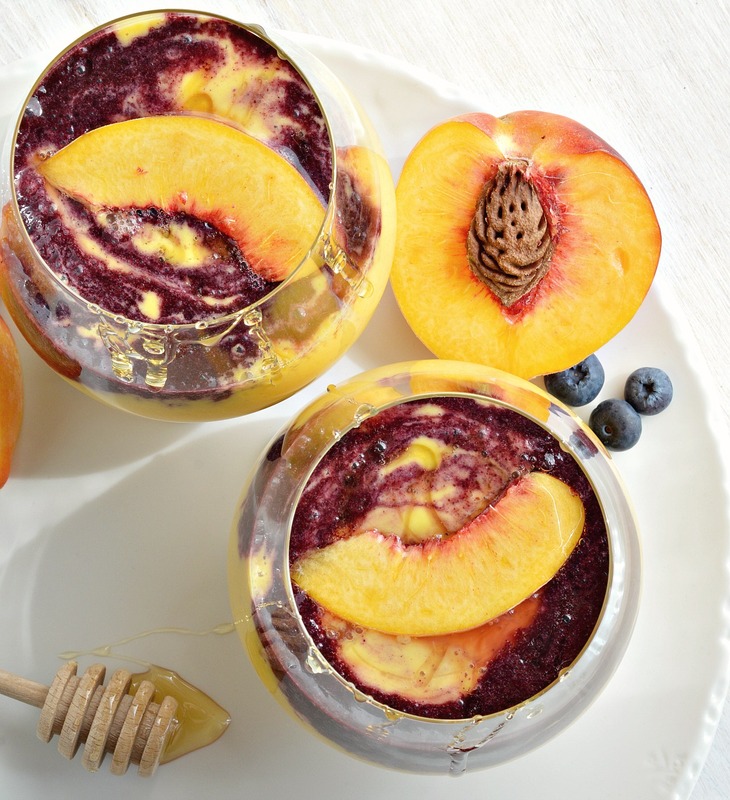 Spoon over the top of the peach layer then give it a gentle stir to blend colors.